BMW Group Malaysia initiated the BMW Shorties more than a decade ago to provide a platform for talented filmmakers and digital content creators across Malaysia to share their creative vision and experiences through locally-crafted stories. To this day, the BMW Shorties remains the longest-running and most prestigious short film competition in the country. The inaugural BMW Shorties was held in 2007 with the theme ‘Mobility’. Amongst 74 short film submissions, Zahir Omar took home the coveted title of the first-ever BMW Shorties Grand Prize Winner with his short film titled ‘K-Hole’. He also took home awards for People’s Choice and Honourable Mention, along with RM50,000 in production grant. 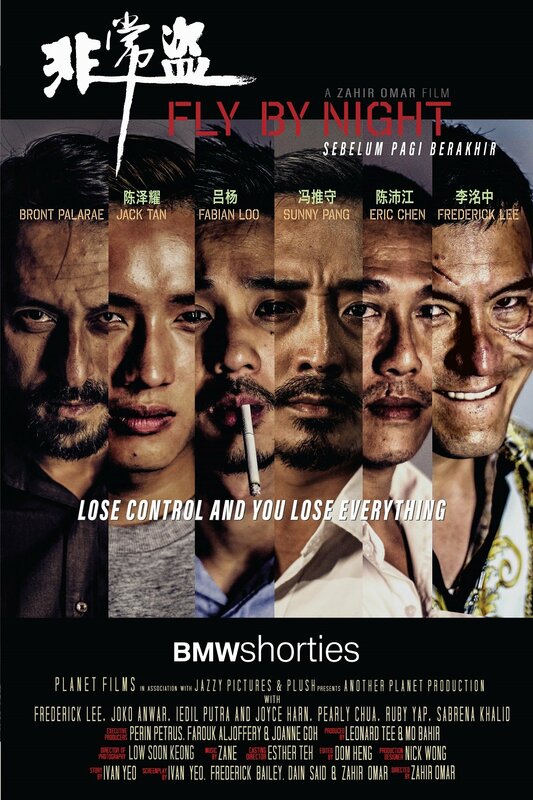 Today, BMW Group Malaysia and the BMW Shorties are proud to support Zahir’s directorial debut feature, Fly By Night. “Through the years, Zahir has sharpened his craft as a film maker. His name is already established in the commercial industry as an experienced director and now, he takes a bold step from making independent shorts to a full-length feature with Fly By Night. For Zahir to have begun his journey with the BMW Shorties twelve years ago, we are extremely proud to see how far he has gone. His achievements are the very reason we began the BMW Shorties and we will continue to identify and support Malaysian filmmakers and digital content creators – whether as a platform to be heard or as a platform to become successful storytellers through the programme. We are proud to stand beside Zahir today and present to you, Fly By Night,” said Sashi Ambi, Head of Corporate Communications of BMW Group Malaysia. Fly By Night is a gritty action thriller following the life of two petty criminals, played by Sunny Pang and Fabian Loo, who run an extortion racket in the heart of Kuala Lumpur. They double as taxi drivers at night, extorting wealthy passengers to fund their criminal dealings. However, greed and ambition get to the best of them as they struggle to evade the suspicions of policeman Kamal, played by Bront Palarae. “The BMW Shorties has given me and so many others a stepping stone into the world of filmmaking. It is truly humbling to have their support not just in 2007 but even now as I venture into my first film. Their continuous support towards my projects even after all these years really means a great deal to me,” said Zahir. Since its release, the Malaysian-made film has garnered widespread international recognition. To date, the film has been screened at the Busan International Film Fest 2018, Santa Barbara Film Fest 2019 and New York Asian Film Fest 2019. Do not miss the screening of Fly By Night in the cinemas this 11th April 2019. Check out Fly By Night’s trailer HERE. For further information on the BMW Shorties, visit the official BMW Shorties website at www.bmwshorties.com.my or the official BMW Shorties Facebook page at www.facebook.com/bmwshorties and Instagram page at www.instagram.com/bmwshorties.